In the Electronics Download area you will find Electronics catalogues, brochures, data sheets as PDF files and Electronics Software. A wide range of electromechanical locking solutions is available for server racks. All locks are equipped with potential-free contacts for remote indication of handle locked/unlocked status. The locks are driven by a standard DC signal. In the idle state no energy is required. Whether as a stand-alone version or network system – AGENT E is always the right choice. Due to its design, it is ideal for new installations as well as for retrofit because of its suitability for various cut-outs and mechanical connections. 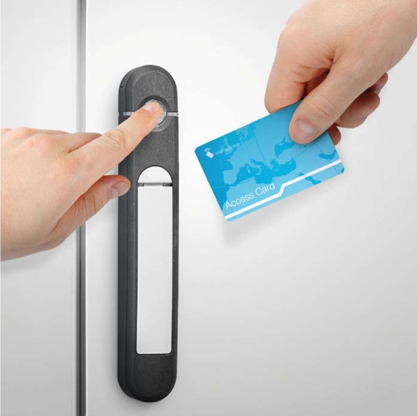 This handle can be installed in minutes and is immediately ready for operation. Being battery operated, no additional wiring is required! Opening is via RFID transponder card. An integrated event log saves all opening and closing procedures. Centralised monitoring, remote opening and parameterisation can be performed wireless via radio transmission. The combination of a keypad with a personal password and card reader allows a “dual factor authentication” for maximum security. 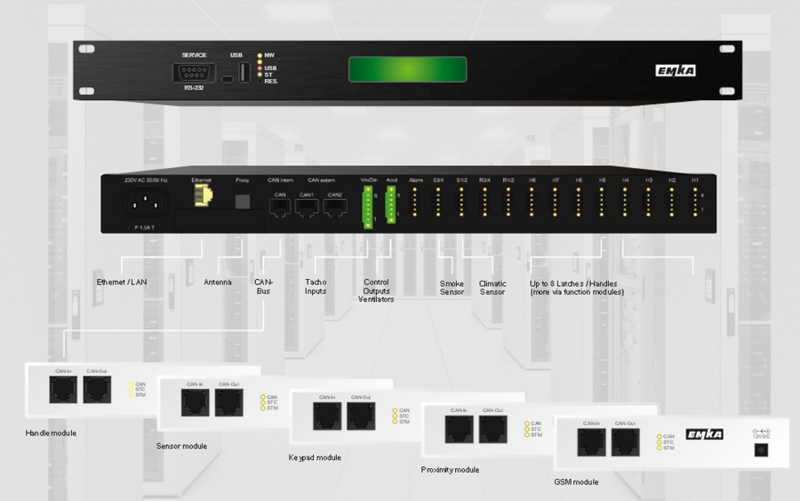 The ELM Rack Management fulfils all requirements of an integrated rack monitoring system. The EMKA 19”- rack mount unit is the ideal starter package and includes several function modules: a communication module as the heart of the Rack Management System, a handle module for driving and monitoring eight door locks, a sensor module for four sensors and optionally a proximity module for access control via RFID card and a GSM module. For temperature control 2 continuous control outputs are available to drive the fan speed and the air conditioning system with different control strategies. The two-line display can be configured to customer-specifics. All components are plugged in via standard connectors. Additional function modules can be hooked up via CAN bus to extend capability of the starter package almost without limit. 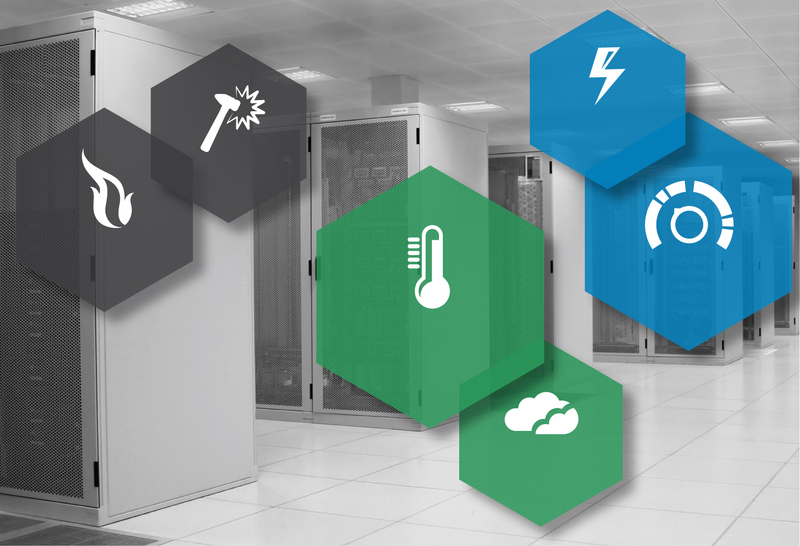 An infrastructure management system consists of a network-compatible communications module as a central unit. 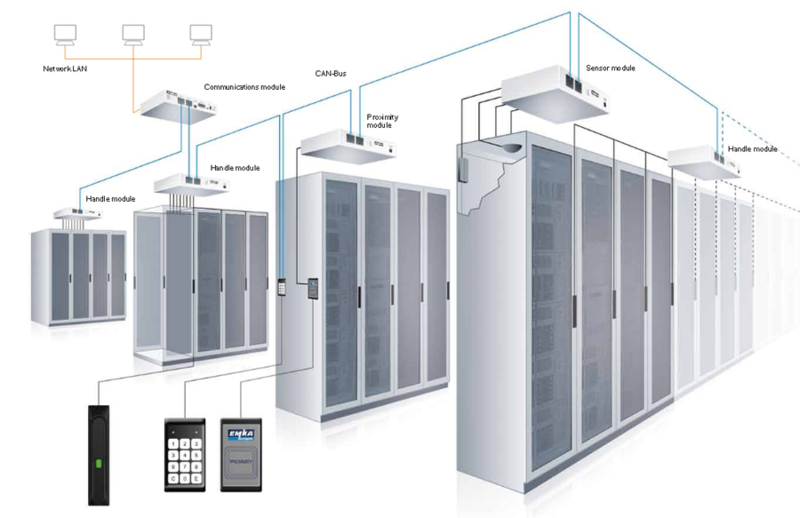 Function modules are connected with standard patch cables and communicate via robust CAN bus to the central unit. 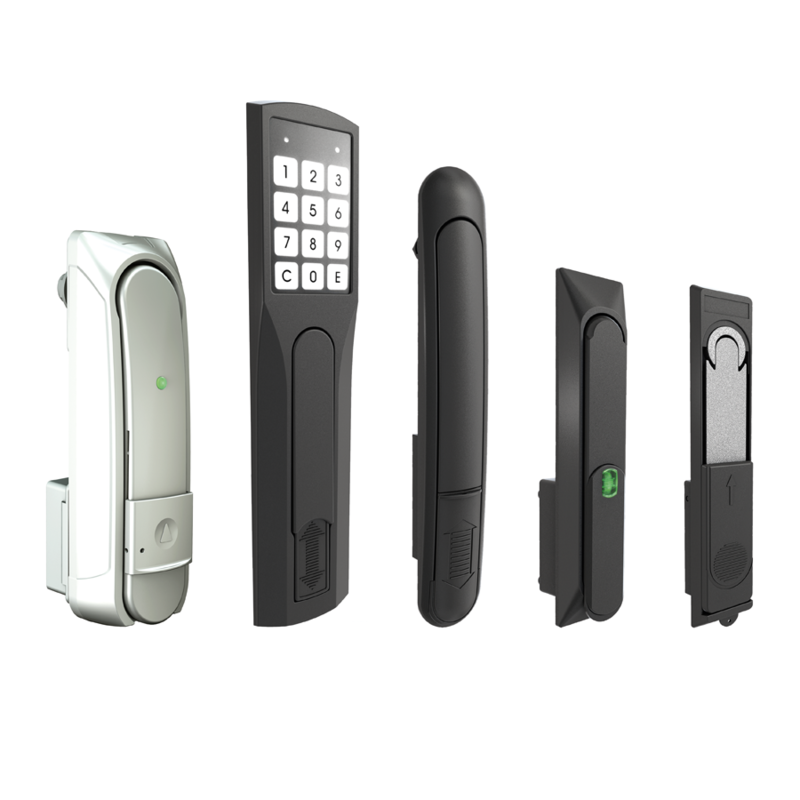 Handles, locks, sensors or card readers are simply plugged into the modules with standard connectors. Modular design and the standardised connectors ensure easy installation and fast commissioning. The required modules are installed in the cabinets as requested. The decentralised structure lowers costs and reduces the necessary wiring costs. The functionality of the system can be extended and completed by adding additional modules at any time. Larger IT systems are often controlled by several different Rack Management systems. This can be necessary due to a large number of cabinets or cabinets being installed in different locations. Such systems are often linked to higher-level control and management systems. In this case, central operation, control and configuration are of decisive importance. The software package EMKA Control Cockpit offers the perfect solution. Technical Characteristics: Please click here!